Ahoi Ashtami is an Indian festival dedicated to Goddess Ahoi popularly known as Ahoi Mata. It is majorly celebrated in Northern India and falls on 'ashtami' or the eighth day of the month of Kartik in the dark fortnight (Krishna Paksha). This religious festival comes four days after Karva Chauth and eight days prior to Deepawali. However, where Amanta calendar is followed i.e. in the states of Gujarat and Maharashtra, this festival falls in the month of Ashwin. Ahoi Ashtami is essentially the festival of mothers who perform the Ahoi Mata Vrat on this day for the wellbeing of their sons. Traditionally it was done only for sons, but now mothers observe this fast for the welfare of all their children. Mothers worship Goddess Ahoi with utmost fervor and pray for a long, happy and healthy life for their children. They break the fast only after seeing and worshipping the moon or the stars. This day is also considered highly important for childless couples. Women who find it difficult to conceive or have suffered a miscarriage should religiously perform the Ahoi Mata Vrat to have a baby boy. This is the reason, this day is also known as 'Krishnashtami’. The holy place of Mathura is thronged by couples and devotees to take the holy dip in 'Radha Kunda'. The story behind the celebration of this festival is the story of a woman who had 7 sons. She went to the forest one day to get some soil. While digging the soil, she accidentally killed a cub or offspring of a hedgehog (Sei) who cursed her. Thereafter, in a span of few years all her seven sons died. She realized that it was due to the curse of killing the cub. To bring her sons back, she observed a 6 day long fast and prayed to Ahoi Mata. The Goddess was pleased with her prayers gave her back all her seven sons. The Ahoi Ashtami Vrat is similar to the Karva Chauth Vrat; the only difference being that Karva Chauth is done for husbands while Ahoi Mata Vrat is done for children. On this day, women or mothers wake up before sunrise. After taking a bath, women pledge i.e. 'Sankalp' to religiously observe and complete the fast meant for a long and happy life of their children. As per the 'Sankalp', mothers have to perform the vrat without food and water and it can be broken only after seeing the stars or moon. Ahoi Ashtami puja preparations are supposed to be done before sunset. 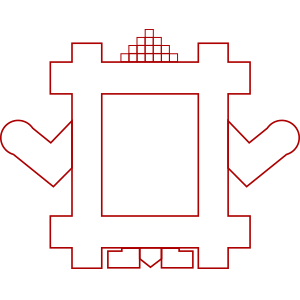 Firstly an image of Ahoi Mata is drawn on the wall. The image of Ahoi Mata should consist of eight corners or Ashtha Koshthak owing to its association with Ashtami tithi. A picture of Sei or cub is also drawn. A holy 'Kalash' filled with water is placed at the left of Maa Ahoi's picture on a wooden platform. A Swastik on the 'Kalash' is drawn and a sacred thread (Moli) is tied around the Kalash. Thereafter, Rice and Milk are offered to Ahoi Mata along with Vayna or cooked food which includes Poori, Halwa and Pua. Grains such as Jowar or raw food (Seeda) are also offered to Maa Ahoi in the Puja. The eldest female member of the family, then narrates Ahoi Ashtami Vrat Katha to all the women of the family. Each woman is required to hold 7 grains of wheat in their hand while listening to the Katha. Ahoi Ashtami Aarti is performed at the end of the Puja. In certain communities, Ahoi Mata of silver known as Syau is made and worshipped. After the Puja, it can be worn as a pendant with two pearls of silver in a thread. After completion of the Puja, women offer Argha to the stars or the moon depending upon their family tradition from the holy Kalash. They break their Ahoi Mata Vrat only after the sighting of the stars or after moonrise.